There are more than 300 varieties of Japanese maples ranging from upright species that grow up to 20 feet tall to dwarf varieties that never grow larger than 5 feet. Japanese maples are a popular plants for specimen trees and landscaping plants. Since the trees vary in leaf appearance, size, overall shape and growth habit, identifying Japanese Maples is not difficult. Measure a Japanese maple’s height. The height of a Japanese maple will help determine if it is a full sized Japanese maple such as Moonfire or one of the dwarf varieties including Skeeter's Broom. Look over the limbs of the Japanese maple. Most Japanese maples are grouped as trees or shrubs. Trees such as Bloodgood have an upright form and grow tall. Shrubs such as Crimson Queen have a spreading form and produce a dome-shaped canopy. Pick a leaf from the tree and count the lobes. Japanese Maple varieties fall within subcategories based on the leaf shape. Trees in the amoenum group such as Osakazuki have leaf lobes that are divided at a moderate angle and split 2/3 of the way to the leaf base. Japanese maples in the palmate group such as Fireglow have leaf lobes that are divided at a deep angle and split nearly 3/4 of the way to the leaf base. Maples in the matsumurae group such as Burgundy Lace are deeply divided at a steep angle and split over 3/4 of the way to the leaf base. Japanese maple leaves in the linearilobum group such as Villa Taranto have narrow, elongated strap-like lobes that divide at the leaf base. Japanese maples in the dissectum group such as Baby Lace have leaf lobes that divide and dissect into sublobes. Japanese maples that do not fall into any of these categories are classified in a separate, ‘other’ category. Green cascade, with its weeping limbs and dissected leaves is a good example of an unclassifiable Japanese maple. Observe the appearance of the leaves. Variegated varieties of Japanese maple such as Butterfly have striped leaves. Touch the bark of the Japanese maple tree. The color and texture of Japanese maple bark varies among trees. For example, Bihou Japanese Maple has yellowish orange bark, Bloodgood has gray bark that shades to light purple along the twigs and stems and Paperbark maple has a reddish bark that peels away to reveal a cinnamon-color under bark. Compare the observed characteristics of your Japanese Maple against a comprehensive list of Japanese maples and their characteristics. 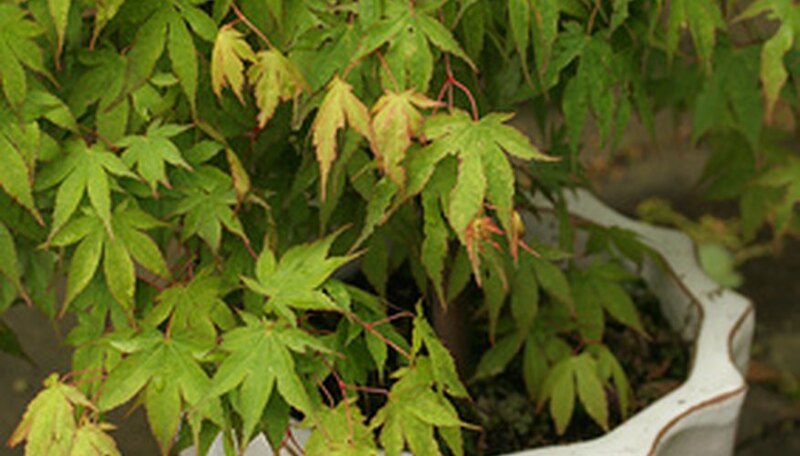 Good sources for Japanese maple varieties include nurseries that specialize in growing the plants as well as books that focus on Japanese maples and organizations such as The Maple Society.